The smallest single bed is 190 cm in length (which is the standard length for any bed, whether single, double or even king size) and 75 cm in width. This is a perfect solution for early teens. It is also possible to go with a bit wider model, featuring the same length but of 90 cm in width. And, of course, if your room space allows it, you can always install a small double in a teenager’s room. 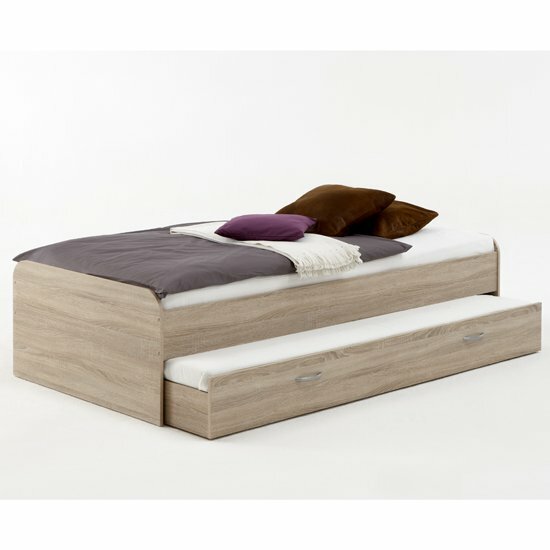 A bed like this will be 120 cm wide, while a standard double is a little wider – 135 cm. While a teenage bed size is a strictly preferential thing that mostly depends on what your kid wants, as well as on the room space you have to work with, a more important issue is bed style and design. Once again, you should first of all ask your kid about his /her personal preferences. No doubt, it might be too late for a racing car bed, so a better way to go are standard, neutral designs. Another thing to focus on, which is even easier to figure out than bed size and design is frame and base materials. Typically, a base will be made of MDF, which is both a durable and affordable material option. Wood is also possible, but it is more expensive and, given that teenage beds hardly ever stay in our homes for decades, it might not be necessary. Yet, when it comes to choosing base material, you should always go for the most durable option. In case of a bed, this is going to be metal. Once again, wood is also possible, but metal will serve you better. A nice selection of teenage, as well as adult, beds is available at Furniture in Fashion . This is one of the biggest online stores in the country, offering a gorgeous choice of high quality models from some of the most reliable local and international manufacturers. Moreover, the company features some of the most reasonable prices in the country and regularly introduces discounts on top of that. In fact, during seasonal sales, it is possible to find finest quality furniture at up to a quarter its initial price. Plus, as a local company, it can ensure quick delivery to any part of the kingdom. And finally, you can always make use of the opportunity to visit a showroom in Farnworth if you would like to take a look at the piece before paying for it. junk How Much Junk Food Do Teenagers Eat?